This section is divided, Sales Invoices, Sales Receipts, Purchase Payments, Purchase Invoices, Wages & Drawings and Bank Account. 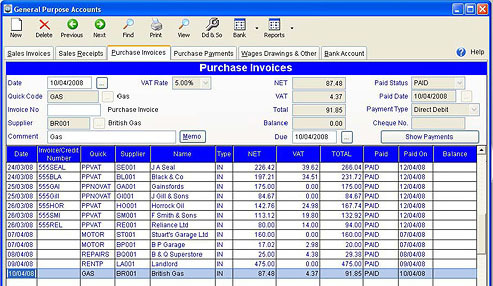 The Purchase Invoices section is the one you will use the most. This section allows you to enter Purchases that you don’t need to pay for straight away. It allows you to see what you have paid for and what you still owe. 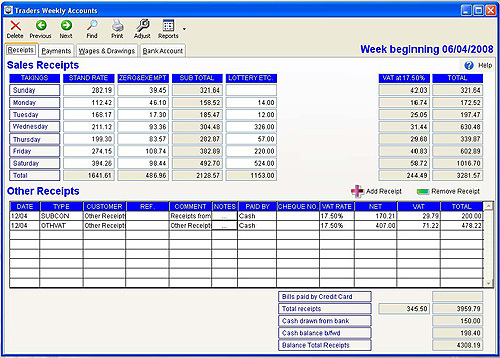 I found this very usefull when using the weekly accounts section I could pick an invoice for payment. These two sections record all transactions one for receipts the other for payment and the reports produced are a useful cross check for VAT. This section allows you to show a purchase you make on an account that does not need to be paid for until up to 30 days later, these payments can be picked up in Traders Weekly Accounts / Payments / Purchases for Resale or Expenses.They will show as balance owing until paid. At the end of your financial year a note should be taken of all unpaid items to produce a list of debtors.